Data from the Ministry of Power shows that all villages of Uttar Pradesh (except two) are electrified, but around 50 per cent of rural households in the state are still unelectrified. 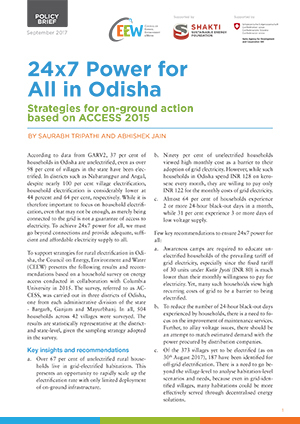 The recent transition from village electrification targets to household electrification, reinforced by the Saubhagya scheme, is a necessary one given that the end-user of the electricity is the household. However, that may not be enough, as merely being connected to the grid does not guarantee access to electricity. 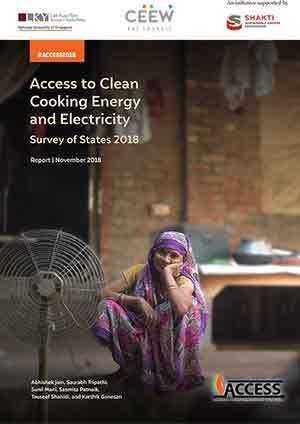 This policy brief presents findings and recommendations, based on the ‘Access to Clean Cooking Energy and Electricity: Survey of States’ (ACCESS) 2015, for improving the household electrification rate and improving the satisfaction derived from electricity for households in Uttar Pradesh. 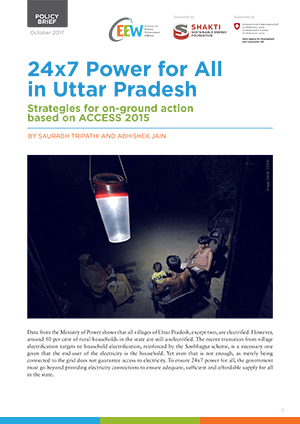 Seventy-one per cent of unelectrified rural households in Uttar Pradesh live in habitations with grid electricity. For them the main barriers to adopting connections were the steep upfront cost, high recurring payments and unreliable supply of electricity. Over 53 per cent of the households were unable to use appliances that they would like to use, only because of limited supply or poor quality of electricity. One-fifth of the electrified households were not receiving any electricity supply between sunset and midnight on a typical day. Less than 15 per cent of electrified households had a meter installed, and at least 20 per cent of electrified households were not paying for the electricity they were consuming. 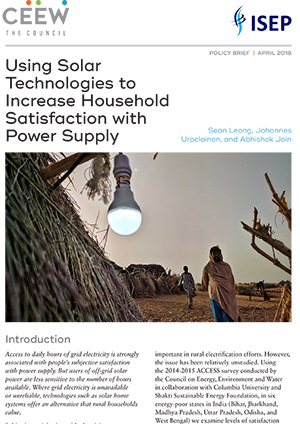 Unelectrified households in the state perceive grid electricity to be too expensive for daily use, even though they spent as much, if not more, on kerosene as their primary source of lighting. 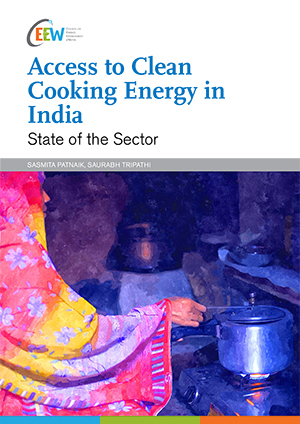 However, many unelectrified households in Uttar Pradesh were willing to pay more for grid electricity than their existing expenditure on kerosene. Organise awareness camps in unelectrified habitations of Banda, Bulandshahar and Kannauj, to educate households of the prevailing tariff of grid electricity, given that people perceive the recurring cost of electricity to be too high, even when they spend more on kerosene for lighting. 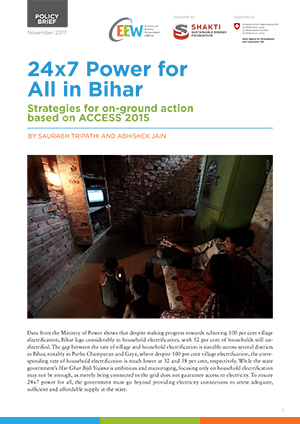 Enable households to use electricity during hours when they need it the most. Increase hours of supply to districts like Aligarh, Bijnour and Mirzapur that receive less than one hour of electricity in the evening. Improve maintenance services to reduce occurrence of 24-hour black-out days, particularly in districts like Siddharthnagar and Sitapur in the north of the state, which report seven days of black-outs in a typical month. Improve the penetration of meters and the efficiency of bill generation and collections across all districts. Regular and correct bills would help in reducing the public perception around high recurring bills. The possibility of distribution franchisees could be explored to improve the billing and collection efficiency and to reduce the losses of the state distribution companies.